Welcome to a series of posts that are dedicated to going beyond the shine of technology by examining ways to use digital tools to engage students in real learning. In this particular post you will discover how careful examination of the standard is essential in proper technology integration. Be on the look out for future posts entitled the ABC’s of PBL and Deeper Learning and also 40 great education sites to discover in 2015. I remember when I first started using digital technology in the classroom. I was in awe of the amazing Apple Classic and programs such as Claris Works and Hyper Card. In fact, I tried to find anyway I could to make this new technology fit the curriculum. Students were so engaged with programs such as Oregon Trail and Lemonade Stand that teachers found ways to make them fit, regardless of the standards. It was 1980 something and computers had finally entered the classroom. Many times it was one computer and thirty-five students, and everyone was being mesmerized by the shine of new technology. I may have forgotten a standard or two, possible even over taught the technology at the expense of some content. It may have even been science class, but somehow we were all on the Oregon Trail… after all there must have been some wildflowers along the way! The lure and brightness of the Apple Classic Computer was just to captivating. I was caught in the shine of an amazing new device. 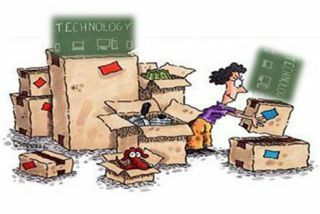 Fast forward to 2015 and one will find many schools replacing their analog tools of the past with a new digital device. Many times this takes on the focus of a “one to one” program. Visions are acquired and missions are written describing how this amazing new device will change the classroom. There is always a great deal of focus on the programs and applications that will change learning. An image is created of students learning and engaging with this new technology throughout the school day. The excitement grows and the shine becomes brighter until it is soon discovered that this amazing new tool is really only… a device. What comes next? Perhaps the most exciting stage, exploring the real possibilities that technology can bring to learning. Let’s call it the pedagogy, or process that allows classrooms to go beyond the shine. In this post I would like to investigate how examining the curricular standards helps teachers investigate ways to integrate technology in order to facilitate student understanding of curricular content. It all really begins with something that has been around for quite awhile. You probably know them as the curriculum standards. A portion or foundation of a curriculum is the standards. Standards make up the general knowledge of what educators want students to know. Standards are a great starting point and through careful examination, exact content and skills can be aligned with technology integration. Simply stated, examining or unpacking a standard allows a teacher to see what a child will know and be able to do. It can also help educators determine what digital resources may work best to help support learning. Now, the phrase “unpacking the standards’ may not bring out the smile you want from teachers. For this reason I will refer to it as finding the technology in the standard. Let’s take a look! I have actually broken it down into five tasks or steps. You may even wish to practice by applying each step below using a standard from your curriculum. As you go through the process it is important to keep focused on the task of “finding the technology and examining” … there will be ample opportunity later to think about specific lessons, activities, and resources. At this stage it is important to look at the nouns, verbs, and learning targets in order to determine where the technology aligns. The nouns could point to numerous OER (Open Educational Resource) sites available on the internet. The verbs may point to numerous Web 2.0 tools and apps. Looking at the standards and applying this “find the tech” filter allows technology to integrate with the expected learning, rather than possibly just shine right through the learning. In the upcoming articles in this series I will focus on wonderful internet content resource sites that you should to get to know as you identify and apply the nouns. I will also point out collections of apps and Web 2.0 tools that help support the verbs. You will also discover great lesson plans collections that can be used to accomplish some of those learning targets. I do hope this provides you a reason to return and be part of the 21centuryedtech Learning Community. Please remember that the best way to avoid the technology shine is to focus on standards while you put students, not devices, at the center of learning. As you emphasize standards and students you will find there are so many amazing opportunities for learning…. beyond the Oregon Trail!